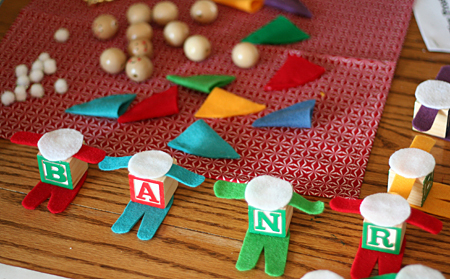 I seriously cannot stop taking pictures of these super-cute alphabet block elves! When I saw these elves at that artist woman, I knew we just had to make them. We used each recipient’s initial for the block body. We decided not to add a loop for hanging – they look so cute sitting on a shelf with their legs dangling over. I still have a bunch of alphabet blocks, but we used all our face beads. I may have to get more so I can have a whole row of these for myself. 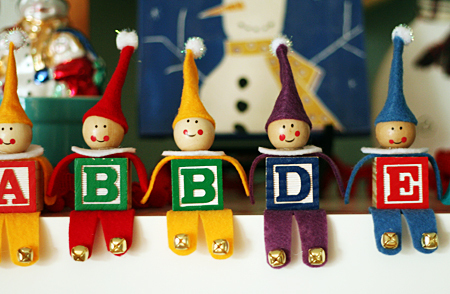 We are looking forward to delivering our alphabet block elves to some very special people! Thanks to Gail at that artist woman for a fun and kid-friendly project! We have been making lots of time to craft this month, and it makes me so happy! Are you crafting with your kiddos? What are you making? Those are super cute! Now if I can just find our old alphabet blocks! I’ll be ransacking the thrift shop for alphabet blocks! I’ll be ransacking the thrift shop for blocks now! Cuteness!